Customers have had a lot of questions on the capability of carrying extra fuel on the Honda Africa Twin. A long time customer, Billy Ray, stopped at happy Trails and showed us his "Honda Africa Twin One Gallon Rotopax". Billy Ray had used the the Inner Tool Plate mount on the Happy Trails SU rack to mount his one gallon Rotopax container. 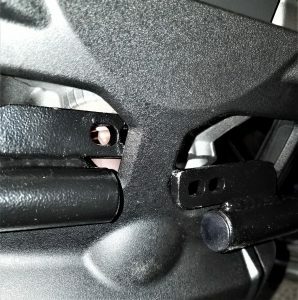 The Happy Trails SU Rack for the Africa Twin design uses a plate welded into the left side SU Rack to mount the Inner Tool Tray. Using the Rotopax Standard Mount and the Rotopax One Gallon Fuel Pack the combination worked very well to pack the extra fuel. The Pannier Kit that was used on the African Twin was the Teton 7 1/2" Clif Cut with the Powder Coat Black option. The Teton 7 1/2 Clif Cut has 7 1/2" Lid with a 6" body, this combination gives you a 36" width of the panniers with a total capacity of 52 liters. 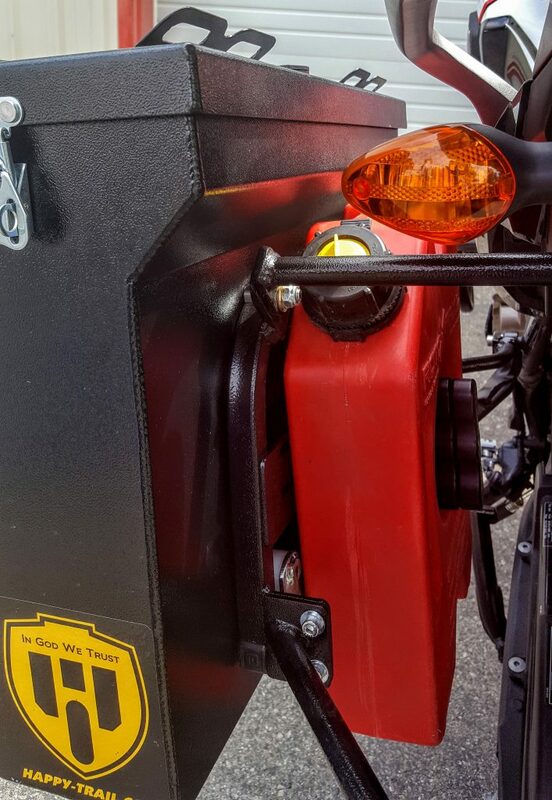 One of the recent comments we received on the installation of the Africa Twin Pannier kit was; "this was the easiest installation I have on any bike so far." This entry was posted in Product Reviews, Adventure Motorcycling on April 24, 2018 by Fairly Inarticualte Tim Bernard. We received an email from a customer telling us the Happy Trails PD Nerf Engine Guards for his 2017 Suzuki DL650 XT were interfering with stock mud guard on the engine. 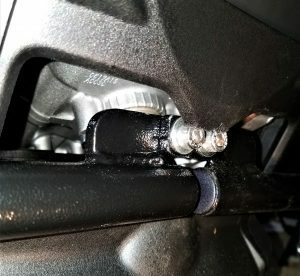 "I got my Happy Trails PD Nerf Engine Guards for my 2017 Suzuki DL650 XT and they didn't fit over the plastic engine mud guard. So like all inventive people I made a modification. 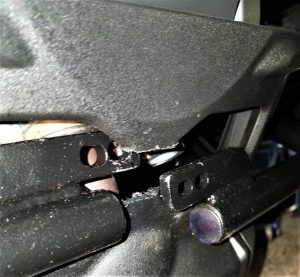 It was removing a small section on the mud guard and I thought you might like the photos of how I accomplished the task." Section of plastic Mud Guard removed and everything fits to perfection. 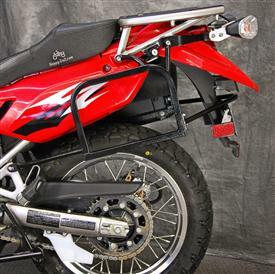 The V Strom 650XT model is the only one with the factory Mud Guard. The Adventure Model and the Base Model for the 2017+ V Strom 650 do not have the mud guard. 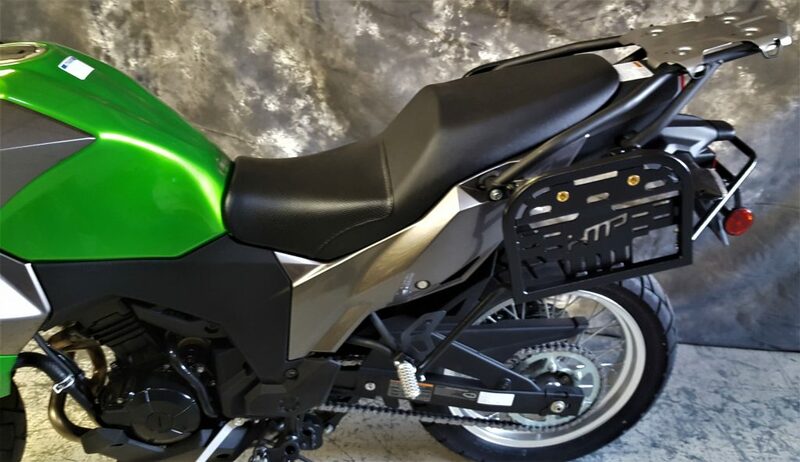 This entry was posted in Product Reviews, Adventure Motorcycling on April 19, 2018 by Fairly Inarticualte Tim Bernard. Happy Trails Products is proud to announce the 2018 Heart of Idaho Rally. The dates for the event are September 6-9 2018. The 2018 Heart of Idaho Rally will be just out of Cambridge Idaho at Mundo Hot Springs. Mundo Hot Springs offers tent camping, RV Spaces, a Hostel, one Cabin and a rental house. The Cambridge area is the gateway to Hells Canyon and offers a vast riding area. Sturgill Mount, Cuddy Mountain,West Mountain, Black Lake, Bear, Cuprum, & Kleinschmidt Grade are just a few of the areas to be explored. 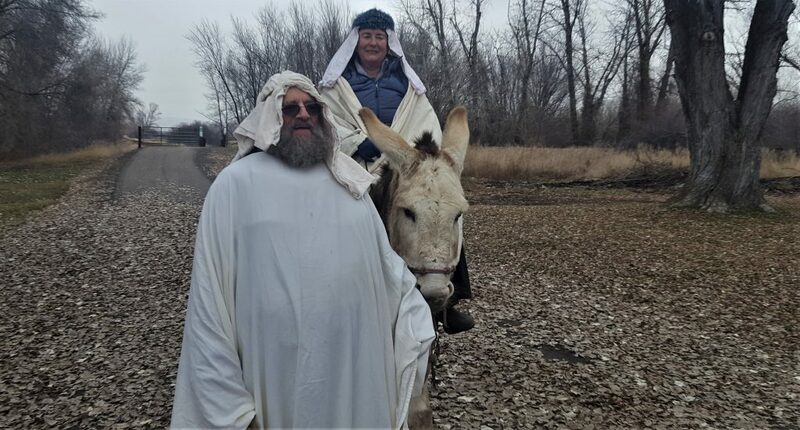 We went to Cambridge in December to check out Mundo Hot Springs and to our surprise we saw some riders on the Weiser trail. It was cold and foggy but they were having a good time. Each evening Riders will meet up and outline what rides they will do the next day. Riders will start showing up Wednesday PM so be sure and let others know what area you want to ride. All bikes must be street legal and you must have a valid Motorcycle License. GPS Tracks will be available. You will be riding in Idaho and Oregon. Gas and food is three miles from camp. This entry was posted in Adventure Motorcycling on January 16, 2018 by Fairly Inarticualte Tim Bernard. 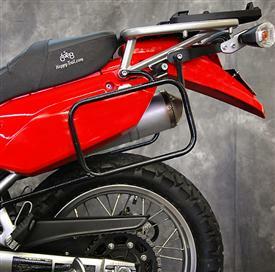 Happy Trails Product is proud to announce Kawasaki Versys 300 SU Rack Luggage Rack. It has been proven to me over and over that a Dual Sport bike (current term Adventure Bike) does not have to bust the bank to be meet your needs. As a matter of fact my motto is “don’t out ride your deductible”. Bottom line is you want something that will perform on the weekend and take you on a multi day trip also. In my opinion the KLR has set the benchmark that ALL of the Dual Sport Bikes are judged by. Will the Versys 300 replace the KLR? No way, they each meet a need and I have been assured the only thing left after WWIII will be cockroaches and the KLR. This entry was posted in Product Reviews on January 12, 2018 by Fairly Inarticualte Tim Bernard. What Child is this? What a great question! Did you know that the song “What Child is this” was written in 1865 by William Chatterton Dix. At the time he was recovering from the illness he underwent a spiritual renewal. How is it that at times when we think we are down and out we are on the edge of greatness, if we would only persist a bit longer. 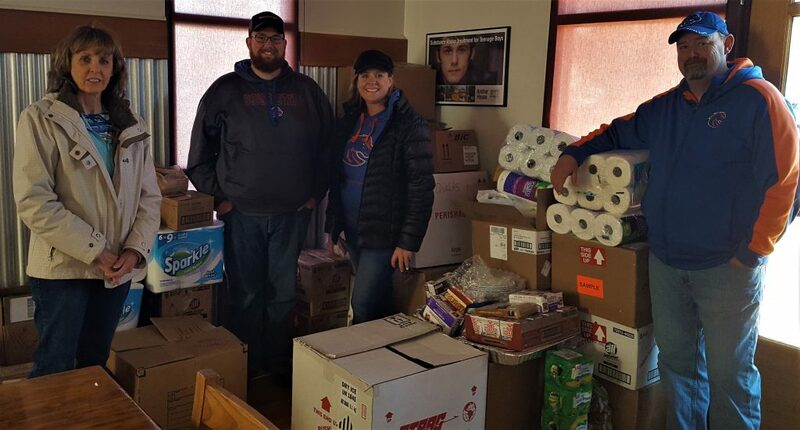 This year for Christmas Sherry and Jen talked about volunteering somewhere and through Jen’s work at ACOSTA an opportunity came about through the Idaho Youth Ranch and Hayes House. Supplying Christmas Eve dinner for Hayes House and Hands of Promise along with gifts and necessities was the mission. The employees at ACOSTA would furnish the food, gifts, blankets, necessities and Gift Cards for the teen residents. WOW is all I can say about the contributions that came out of this. Sherry immediately started networking through Boise Basin Quilters to supply a quilt for each of the teen residents. Through Sherry’s efforts twenty five quilts were supplied! Some of the quilts were complete and some were not, this prompted more networking and the whirr of the sewing machines were persistent until all twenty five of the precious quilts were completed. This entry was posted in Tim Says ... on December 28, 2017 by Fairly Inarticualte Tim Bernard. Tennessee to the Oregon coast. ...so needless to say he has some experience packing a bike for adventure. This entry was posted in Adventure Motorcycling on June 27, 2017 by admin. Free Pannier Packing Seminar On June 15th! Happy Trails, partnering with Birds of Prey Motorsports are pleased to announce a FREE Pannier Packing Seminar on Thursday, June 15th from 5 to 7 pm. This pannier packing demonstration will be provided by the Treasure Valley's Best Packer Ken Hunter. Join us for a fun night to help prepare for your road trip adventures! Free admission & snacks will be served! Tell your friends! Free Admission! Refreshments will be served. Please join us for a fun night to help prepare for your road trip adventures! This entry was posted in Panniers on June 7, 2017 by Fairly Inarticualte Tim Bernard. Robert Runyard used to be a test rider for Yamaha Motors (and Yamaha Parts Distributors) back in the 1970s. In 1977 he borrowed an XS650 and rode it to Tierra del Fuego. He decided back then that he really liked southern Patagonia and that one day he’d return and stay there. He made good on that in 2008 when he quit his job as an engineer for Lockheed Martin, and started running tours on his small fleet of KLR650 bikes -- that just happened to include a bunch of hardware that Happy Trails sells. Runyard’s tours operated from Puerto Natales in Chile, to the end of the road in Tierra del Fuego, and up into the glacier parks in the Andes in Argentina. These days Runyard works more as a translator for the Chilean Antarctic Institute than as a tour guide. But in early 2017 he was wondering if he might be too old to do a good, long adventure ride. So he took a ten-year-old battery off the tenders, stuck it in a 2006 KLR, and set off for what turned out to be one month and 7500 kilometers of riding. Had it not been for competing commitments, it just might have been for two months. It started with a boat trip through the fjordlands, to reach the southern end of the Carretera Austral. And then as the autumn rains set in around southern Chile, he took the Navimag ship home to Puerto Natales. This entry was posted in Adventure Motorcycling on May 22, 2017 by Fairly Inarticualte Tim Bernard. How are Happy Trails SL Rack and SU Rack different? The SL Rack is designed to carry soft luggage, while the SU Rack can carry soft or hard luggage of any kind. In construction the SU Rack differs in that the loop tubing is 3/4" square steel as opposed to 5/8" round. But even more important every SU rack has a third mounting point for greater strength. Finally it has a rear bumper which ties both sides together. If you only want to carry soft luggage, then the SL Rack is for you. If you might want to carry hard luggage at some time, then you need the SU Rack. People use our SU Rack for every kind of hard luggage imaginable. They fix the luggage to the rack using our mounting puck system. Our mount kits make it a cinch to take your panniers on and off. SL Rack: The SL rack loop is 8" x 12". SU Rack: The L to R inner dimension is 10.5 inches and inner bottom to bottom of pem insert is 5 1/8 inches. Although not usable the inner top of loop to bottom loop would be 7.5 inches. Thus overall outside measurements of the loop would be 12" wide and 9" tall since the loop is constructed of 3/4" square tube. This entry was posted in Product Reviews on March 31, 2017 by Fairly Inarticualte Tim Bernard. Imnaha Oregon to Orofino Idaho via the Zumwalt Prairie. Starting the morning out in a deep canyon has its benefits. You have the sunshine but not the total brightness of the light. I guess you can say it is like a having a great stretch in the morning. You know the kind where you wake up easy, nothing harsh, no alarm clock, just start that easy wake up process and in the midst of it get a great stretch in. Arms stretched wide and head turned a bit,waking up from the inside out, nice and easy. As the bright sun hits the ridges and starts illuminating them, you feel the day as a new beginning. This entry was posted in Adventure Motorcycling on January 29, 2017 by Fairly Inarticualte Tim Bernard.